The Glenwood Hot Springs have been used for therapeutic purposes for hundreds of years, from the Ute tribe before the arrival of Europeans to the construction of the world’s largest naturally heated pool in 1888. Nearby, the Yampah caves are the only known natural vapor caves in North America. The Utes used them for their healing powers as well, and they’ve had electric lights and marble benches since the late 19th century. Now, there’s a newcomer on the scene: the Iron Mountain Hot Springs. 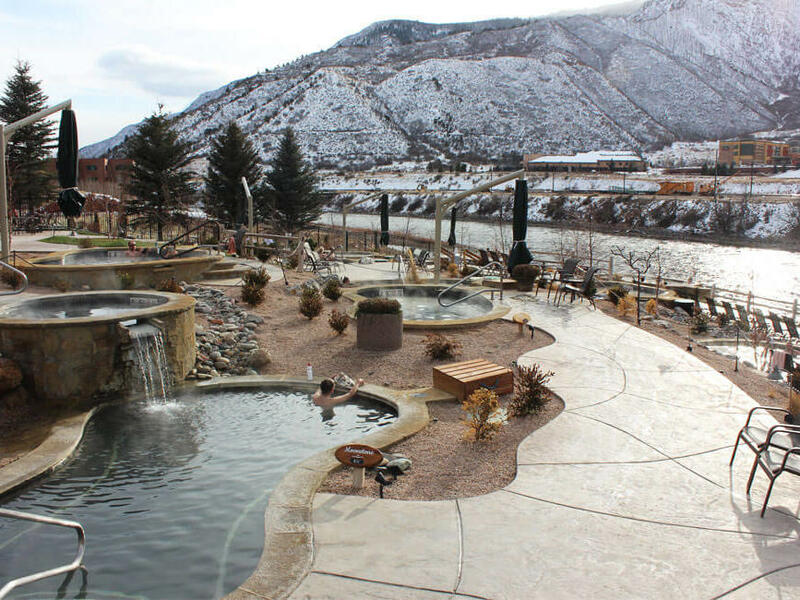 Located just downriver from Yampah and Glenwood Hot springs, in the shadow of Iron Mountain and looking up at Mount Sopris, the “monarch of the valley,” Iron Mountain Hot Springs opened in 2015 and have been a unique addition to the Glenwood Springs experience ever since. Rather than one big pool, Iron Mountain has sixteen separate soaking pools, most of them only large enough for a few people at a time. The pools are fed directly from the springs, with 100% pure thermal mineral waters ranging in temperature from 98 to 108 degrees, so you can have the exact spa experience you want. Surrounding the pools is quiet, calming landscaping, with natural rock and local plants creating a rustic atmosphere to relax in while you watch the sunset over Red Mountain to the west. A Cooling Corner, complete with rainfall showers, allows you to cool off between soaks, and the soaking pools are connected with heated walkways for easy access even in the winter. The freshwater family pool is the largest of the pools. At 73 by 35 feet, it’s big enough for families to enjoy and heated to a comfortable 93 degrees — warm enough to be cozy, but not so hot as to be uncomfortable for small children. Just above it and to the side, a smaller pool at a luxurious temperature of 100 degrees lets parents supervise their children while relaxing themselves. In the bathhouse, styled after a traditional mountain lodge, you can buy tickers, shop at the gift shop, and dress and undress in beautiful locker rooms, complete with towels, shampoo, conditioner, and body wash. There are also separate, handicap-accessible changing rooms available for families and caretakers. The shop also sells swimwear — the springs are rich in iron, sulfate, chloride, sodium, and calcium that may discolor your swimwear and jewelry. It’s recommended that you leave your jewelry in the locker rooms before you go into the pool. When you need a break, visit Sopris Cafe, located on-site right next to the family pool. You can dine by the pool or on the patio, which has zip-down walls and a fireplace to stay warm even in the cold of winter. You can order food, snacks, coffee, and drinks at the cafe, or head to the Sand Bar next to the soaking pools for drinks and refreshments. However you enjoy the Iron Mountain Hot Springs, don’t forget to pair them with a stay at Hotel Colorado. Our Soak and Stay package includes one night’s lodging for two in the majestically appointed Hotel Colorado and two Adult Pool Passes to Iron Mountain Hot Springs.